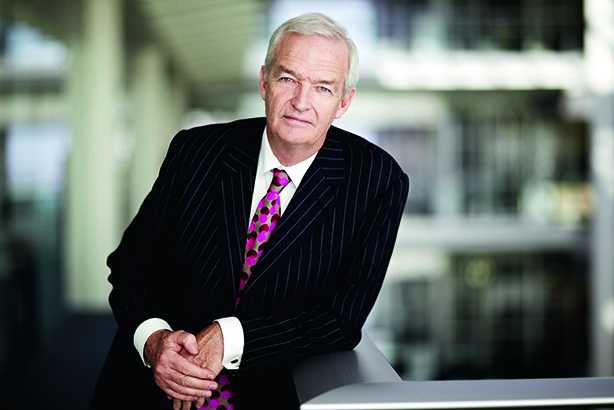 Jon Snow, the veteran broadcaster who has presented Channel 4 News since 1989, has the day off. But it’s hardly relaxing. We are in the ornate Great Room of the Grosvenor House hotel on London’s Park Lane, where tonight he swaps the news studio for presenting the PRWeek Awards to 1,000 industry professionals. Snow is an archetypal news man, as well as an inspiration to a generation of journalists who, like me, spent their formative years glued to his programmes as our dinner went cold. Then, around the table, we would debate his technique of gently skewering interviewees. But don’t make the mistake of thinking him ‘old school’, despite his self-confessed inability to master video editing. He fronts an organisation at the cutting edge of digital media and has embraced the changes that come with it. "We have a date!" he exclaims when I introduce myself following his rehearsal as compère for the awards, and usher him to one of the smartly laid tables for our interview. Speaking to the assembled cream of UK PR and comms at the 2016 PRWeek Awards, Snow tells his audience that Channel 4 News presides over an enviable social-media presence, with 1.2m followers on Twitter and a Facebook page that receives 250 million hits a month. This compares favourably with BBC News, which receives 167 million hits, Sky News with 125 million, and ITV News’ 67 million. He regards Channel 4 News as having pioneered TV news for mobile, releasing up to 20 "gobbets" of news a day. 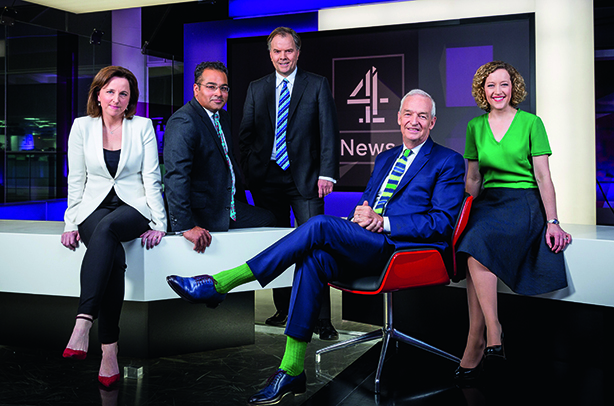 Despite the programme’s impressive history – it has been running since the channel’s launch in November 1982 – Snow evidently still considers it the plucky challenger to longer-established news programmes. "We all have a chance in life," he tells the audience. "You can be as small as you like and still succeed." To be fair to Channel 4 News’ rivals, all of them enjoy a bigger Twitter following, with BBC News leading the four with 7.2 million followers. Nonetheless, the 1.1 million followers of Snow’s personal account are testament to how he has cemented himself in the hearts and minds of the nation, presenting the news for nearly three decades with his trademark, affable ‘give them enough rope’ interview style. It stands in marked contrast to the abrasive 'attack dog' approach perfected by Jeremy Paxman in his BBC Newsnight days. Now 69, Snow has seen his fair share of change in an industry that has witnessed the continuing ‘managed decline’ of print and a switch to more bite-sized chunks of video journalism. As a result, his predictions for the future of journalism are simultaneously upbeat and unsettling. "There will be jobs that amount to journalism, but they will be online and multi-skilled," he says. "They won’t be people like me – I couldn’t video-edit my way out of a paper bag. There’s nobody else in my newsroom who can’t do that. I just think it’s going to be a different beast; doing the same job a completely different way. There will always be a requirement for journalists; it’s just that they won’t be allowed to sit behind a typewriter." On that basis, his advice for nascent journalists is straightforward: "I say, get onto an online team." Who has the hardest job? In a recent PRWeek survey of what journalists and PR professionals really think of each other, roughly half of the journalists agreed that PRs have a difficult job. It’s clear that Snow appreciates the travails faced by his on-air counterparts in PR and comms. "To be honest, I think the ‘PR man’ is in a lot of trouble," he says with a chuckle. "I wouldn’t envy their job at all. In the end, although it requires original thinking – some of it uninformed by the subject they are trying to represent – it’s a fantastically dodgy business, because you have to try to get it right, and you have to foresee what I am going to ask you. Obviously I, in turn, am looking for a left-field shot, or a right-field shot. So I think they really have to be chess grandmasters." In the course of his job, Snow interacts with PR and comms professionals on a daily basis. If live-broadcast interviewing is sometimes a gladiatorial contest, in which interviewer and interviewee carefully size each other up, I wonder what character traits Snow, with nearly three decades of experience, respects in his opponents. "I admire their originality, I admire their courage and I admire their capacity to lie," he says with a wolfish grin. "One thing I learned very early in the trade was never to be incensed by PR people, because it’s not their fault. They’re doing a job. Sometimes they do it exceptionally well; sometimes, it feels like it’s closing in on fiction. But what’s the point of getting angry with them? The only person one is really exercised by is the subject – and if the PR guy has done a great job, the subject might get away with it." Snow, unlike some of his contemporaries in news, is famously calm and collected when he conducts interviews, which makes his infrequent outbursts of anger all the more compelling to watch. He says: "I must confess the last time I allowed myself to become incensed by a PR man was with Alastair Campbell, over the ‘dodgy dossier’ in the Iraq war, live on air in the Channel 4 News studio, and that taught me my eternal lesson." I remind Snow that he has also had several run-ins with Mark Regev, former spokesman for Israel’s Ministry of Foreign Affairs, while interviewing him on the programme. "Well, he’s now the Israeli ambassador to the UK, so I have to watch what I say," laughs Snow. "I think Mark Regev did the job he was paid to do, and I did the job I was paid to do. In fact, he remained relatively cool and I probably did allow myself to become a little bit heated – although, I felt, with justification." Newsgathering is often characterised by somewhat bruising encounters between journalists and members of the PR industry, with the former intent on producing a story and the latter just as committed to preventing it from getting out. Does Snow regard news as a form of contact sport? "I don’t see it as an aggressive enterprise," he says. "I see it more through the frame of Sherlock Holmes: I feel that I’m in pursuit of an elusive concept called the truth." To be useful, a news interview is necessarily robust in order to try to elicit the required information, but there is a careful balance to be struck for this to be a fruitful encounter for the reader or viewer. Snow adds: "The key is, does it leave the consumer uncomfortable? If it does, it wasn’t the right thing." He recounts how he had interviewed the former Cabinet minister, Iain Duncan Smith, on the programme on the same day as he had referred to the Labour Party’s Brexit shadow minister and former director of public prosecutions, Keir Starmer QC, as "a second-rate lawyer". An on-air tussle then ensued when Duncan Smith attempted to modify his earlier comment, to say that Starmer had given "second-rate legal advice"; however, Snow insisted that Duncan Smith stand by his initial statement. Snow recalls: "I said, ‘The record will show that you said it.’ He was made uncomfortable by that, and it was right. I wondered whether it would make people uncomfortable or not because I was actually really angry." These rare flashes of temper on Snow’s part are not typical of his relationship with the PR industry and he does not believe in an adversarial approach. "Absolutely not," he insists. "If you want access to something – it might be Hinkley Point, it might be Sellafield – there’s no point getting uppity with the PR person if you want something out of them." Can journalists and PRs be friends? There is an element of theatre to TV news that is not present in print, online or even radio, so it is tempting to regard on-air bust-ups as a form of pantomime. One imagines everybody shaking hands afterwards, like players following a bruising sporting encounter, but the reality is not as quaint. "After the programme is a tricky moment," explains Snow. "If the PR person is in a forgiving and tolerant mood, then I will match it. If not, it’s usually a stony silence." One wonders whether PR people and journalists can really be friends, or whether any display of civility between the two camps is solely a marriage of convenience. 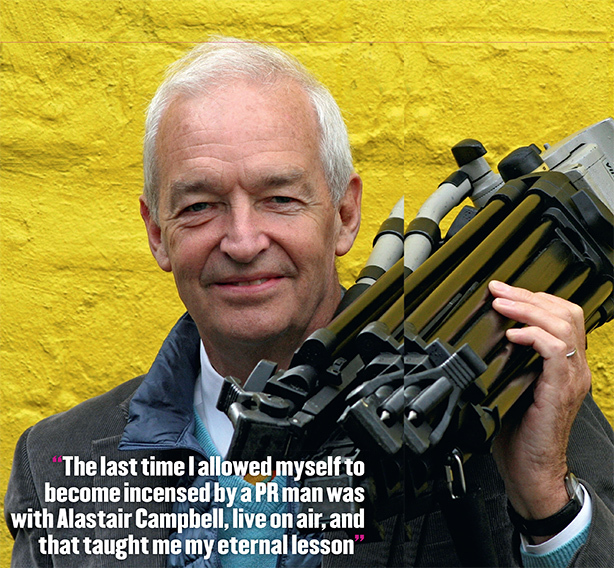 "I regard myself as friendly with Alastair Campbell, though he might question whether he was still a PR man," Snow says. Snow’s lurid, vibrant ties, some of which are akin to the experience of watching the vertical hold slip on an ancient television set, have become the stuff of legend. I imagine him in front of a wardrobe before going on air, thinking: "I’ve got Regev coming on, so I’m going to wear the most fuzz-inducing tie I can to blind him." "No such luck," Snow says. "No, they are a brand, and I discovered branding very early on. I’ve added socks to them." Naturally, I ask Snow to show me his socks: he reveals a pair of pastel-pink foot-warmers. He continues: "So effective has it been, that the woman who makes some of my ties has started making socks. People come up to me and say [puts on low growling voice] "Can I see your socks?" It happened to me yesterday." Snow would probably be a not-for-profit organisation’s dream candidate for spokesman. But the third sector may as well shelve any strategy it might have for recruiting him, because, while he is affiliated with several charities, NGOs and good causes, it does not sound like a role he will take up any time soon. He says: "I don’t think I could, because I don’t think I could be so loyal. I am quite a loyal person, but that might stretch it beyond breaking point." A proliferation of online content means that, for a younger generation that has grown up with this new reality, news is on a par with product information. Is Snow comfortable with that? Referring to Channel 4 News’ impressive social-media stats, he says: "I am very excited by social media. I’m not going to start pouring cold water on the newest game in town. I’d rather [young people] were receiving some information than none at all. There was an interesting moment when television was a little in decline, but social networks hadn’t really taken its place, and you worried that they would give up looking for information, but that hasn’t happened." The idea of brands promoting their world view at the expense of news, using well-crafted segments online with high production values would seem like anathema to such an accomplished journalist, but Snow is surprisingly sanguine. "You see, I would have been critical, but I’ve discovered that our own brand is vastly more successful than I ever dared hope. I think all’s fair in love and war, to be honest."